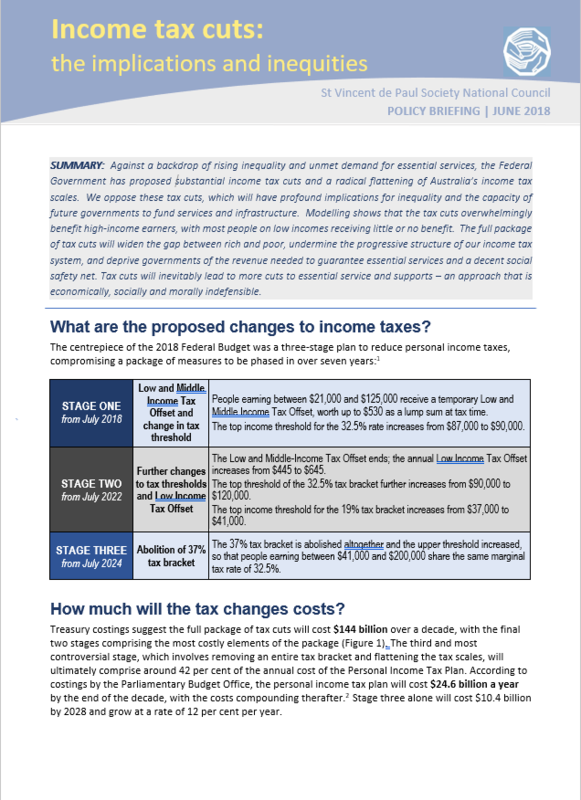 Against a backdrop of rising inequality and unmet demand for essential services, the Federal Government has proposed substantial income tax cuts and a radical flattening of Australia’s income tax scales. We oppose these tax cuts, which will have profound implications for inequality and the capacity of future governments to fund services and infrastructure. This briefing reviews the evidence and implications of the Government's seven-year tax plan, and dispels some of the myths and misconceptions that have been used to justify the tax cuts. Modelling shows that the tax cuts overwhelmingly benefit high-income earners, with most people on low incomes receiving little or no benefit. Our analysis shows that the full package of tax cuts will widen the gap between rich and poor, undermine the progressive structure of our income tax system, and deprive governments of the revenue needed to guarantee essential services and a decent social safety net. Tax cuts will inevitably lead to more cuts to essential service and supports – an approach that is economically, socially and morally indefensible.